Sally Oldaker and Louise Robinson pop in to The Coach & Horses Inn to see its new look and sample the food and drink. 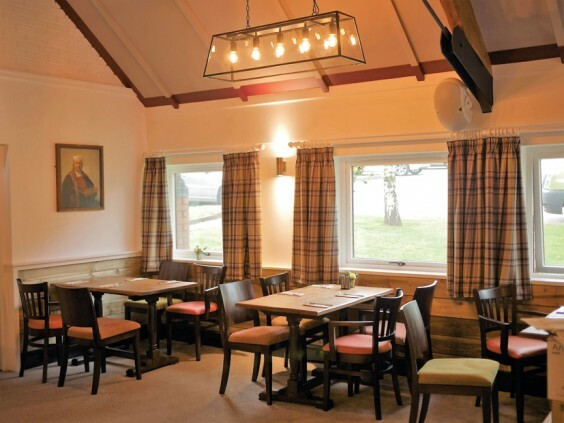 Equally popular with both drinkers and diners, The Coach & Horses at Weatheroak has unveiled a stylish new look that seamlessly integrates the previously separate bar and restaurant. Both areas have also undergone a complete refurbishment, updating the decor and furnishings for a more contemporary look but without resorting to the sleek minimalism of many a modern bistro. The interior now feels more spacious thanks to large windows letting in the light, while timber-clad walls, exposed beams and warm fabrics retain that all-important country pub ambience. The connection to the bar area adds extra atmosphere to the restaurant, which is now buzzy enough to feel lively but calm enough for chatting over a meal. Outside, the large beer garden is perfect for summer drinking and dining, and the patio area has been smartened up to give a great impression of the venue as you approach. On cosy winter evenings there’ll be a double-sided open fire where the restaurant segues into the bar, which continues to serve a wide range of real ales – including, of course, those brewed on the premises by the venue’s own Weatheroak Hill Brewery. Meanwhile, food at the family-run pub continues to combine unpretentious classics with something a little different – as The Village rediscovered when we were invited along to see the new look and enjoy a meal. The restaurant was busier than we expected for a Wednesday lunchtime, with several large groups dining – but the busy serving staff still made time to answer our questions, bring drinks (Weatheroak Hill Brewery’s IPA was in very good order) and pop back to check everything was OK.
A new menu was due to launch a couple of weeks after our visit, but the existing list offered plenty of tasty-sounding options. Starters included deep-fried Brie with apricot chutney, smoked mackerel and horseradish paté, and soup of the day, but I decided on the lamb koftas (£5.50), swapping the mint yogurt for a sweet chilli dip. These were really tasty and just the right size for an appetiser, served with a crunchy salad and a tangy kick from the sticky dip. Louise went for pan-fried Portobello mushroom in a Pinot Grigio and Stilton sauce (£5.95), which skilfully combined those disparate ingredients; served atop a garlic bruschetta, the juicy mushrooms achieved the right balance, neither swamped by a strongly-flavoured sauce nor too dry. There was bags of choice when it came to mains, with the larger dishes including chargrilled pork loin with vanilla and apple puree, bacon-wrapped chicken with red pepper sauce, and “posh cottage pie”, while the smaller Weatheroak Specials featured lasagne, steak and onion pie, and faggots and peas. There was also a grill section and a selection of homemade stone-baked pizzas, plus jacket potatoes, baguettes and salads. 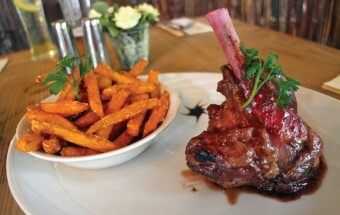 I was tempted by the Mediterranean vegetable gratin with grilled goat’s cheese, but in the end picked slow-roasted Burgundy lamb shank with rosemary gravy (£13.95), swapping the red onion mash for sweet potato fries from the list of sides. The fries were fabulous, while the lamb itself was incredibly tender with a great flavour of rosemary. Lou’s choice was the beer-battered cod with chunky chips and mushy peas (£5.99; a larger version is available) and this also met with approval – the batter was really light, the chips were perfect and the tartare sauce obviously homemade. All our dishes were attractively presented by a kitchen that clearly knows what it’s doing. Sadly we didn’t have room for puddings (and we also had to get back to the office and do some work!) but they included summer fruit crumble, poached pear brûlée, homemade sherry trifle and various ice cream sundaes, and were likely to be just as good as the food we’d sampled. If you’ve not visited The Coach before, do. And if you were concerned the refurb would spoil its traditional nature, worry no more – the new look has enhanced the overall atmosphere while the food and drink continue to impress.